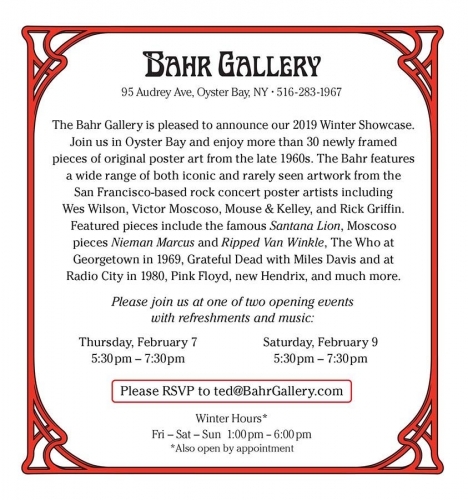 Come to the Winter Showcase at the Bahr Gallery in Oyster Bay and enjoy more than 30 new framed pieces of original poster art from the late 1960s. The Bahr features a wide range of both iconic and rarely seen artwork from the San Francisco-based rock concert poster artists including Wes Wilson, Victor Moscoso, Mouse & Kelley, and Rick Griffin. Featured pieces include the famous “Santana Lion,” Moscoso pieces from, “Nieman Marcus,” to “Ripped Van Winkle,” The Who at Georgetown in 1969, Grateful Dead with Miles Davis and later at Radio City, Pink Floyd, new Hendrix, and much more. Please join us at one of two opening events with refreshments and music.